The baseball season, as people will often tell you, is a marathon, not a sprint. It might be even more like an ultra-marathon, one of those races that lasts a hundred miles in the middle of the desert. Once it gets going, the regular season feels like it goes on forever. The idea here is to downplay the significance of any short spurt. There’s an awful lot of time for the standings to normalize. At some point, every team will look very good, and every team will look very bad. Now, I’ve never run a marathon, myself, but I do know that, among competitors, the splits are critical. When you’re trying to keep up with champion runners, it can be incredibly difficult to make up for a substandard start. That is, even in a marathon, a slow first mile is a problem. A fast first mile can be good or bad — this is where the comparison breaks down. It’s harder for a baseball team to over-tax itself in the first handful of games. But anyway, starts matter. The baseball season has started, and as a consequence of the results, we’ve already seen some numbers shift around. This is a post I like to get to early in every season. I always get a kick out of it, but at the same time, I also always know it causes people to roll their eyes. It’s way too soon to think about how the season’s going to finish. The season only just began. Games are getting called because it’s too cold, or there’s too much snow. The current leader in position-player WAR is Didi Gregorius. It takes a while for the season to get into a routine, as players are still ramping up to full speed. Mike Trout isn’t yet slugging .550. We all have to be patient. But this post is a reminder that it’s never too early for the games to count. Every game in the books already has gone for a win or a loss. Every game in September will go for a win or a loss. Of course, the landscape has changed. We have new information. Last year’s Blue Jays and Royals could never fully recover from slow starts. The Rockies took advantage of a hot start. Let’s take a look at how our numbers have already changed. You know we have projected standings. We have current projected standings, and we have projected standings from the day before the start of the regular season. Here are all the changes in expected final win total. Based on our own math and depth charts, the Mets are already up 4.5 wins. The Angels are right behind them, at +4.2, and then we have the Diamondbacks at +4.0 and the Pirates at +3.6. To round out the top five, the Red Sox are at +2.8. At the other end, the Rays are already down 3.6 wins. The Padres, Dodgers, and Reds are all at -2.6, and then the Orioles are at -2.5. Many teams, of course, haven’t shifted very much, because all the teams have barely played any baseball, but the strong starts and the bad starts all mean something. It’s arguably more important to look at the playoff odds instead. 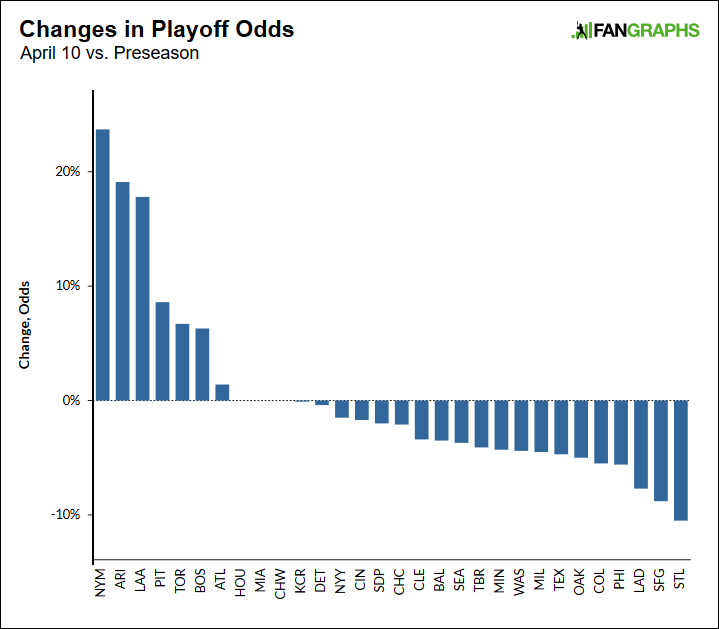 So here’s the same plot, only this time looking at the changes in the playoff odds, rather than wins. Viewed like this, no one has had a more encouraging or productive start than the 8-1 Mets. The Mets’ chances of making the playoffs, according to us, have gone up 24 percentage points already. It’s not just that Noah Syndergaard looks good and healthy. It’s not just that Jacob deGrom looks good and healthy. The bullpen has been outstanding, Michael Conforto is back and hitting the crap out of the ball way ahead of schedule, and the club recently wrapped up a three-game road sweep of the Nationals. The Mets are 3.5 games ahead of the Nationals, today. They used to be projected 8.2 games worse. The gap has narrowed considerably. It’s never too soon to sweep your main rival. The Diamondbacks’ odds are up about 19 percentage points. Similar to the Mets, they’re 8-2, and they recently swept the Dodgers. They also won series against potential wild-card rivals Colorado and St. Louis, so the same ideas apply. The Diamondbacks are in better division and wild-card position, and they’ve already been weathering the absence of Steven Souza Jr. Patrick Corbin looks like a new pitcher. There’s a lot to like down in the desert. The other big odds jumper would be the Angels, up roughly 18 percentage points. In part, this is because the Angels are 8-3. And in part, this is because Shohei Ohtani has already improved both his hitting and his pitching projections. Ian Kinsler is about to come off the DL, which is further good news. And Andrew Heaney should be back soon. On the downside, the Angels have lost J.C. Ramirez for the year, and Matt Shoemaker is also having arm problems, so it’s not as if everything has been sunshine and rainbows. There are very real questions about the Angels’ pitching depth, but Ohtani has helped to fend them off. In our five-team projected AL playoff pool, the Angels have replaced the Blue Jays. The biggest drop belongs to the Cardinals, whose odds are down about 11 points. At 4-6, the Cardinals haven’t been dreadful. And now, they have Greg Holland on the roster. But, well, Holland was horrible just yesterday, in his season debut. And this is mostly about the wild-card competition. The Cardinals began as favorites for WC1, clear of the NL’s sixth-best team by 6.3 games. Now the Cardinals project as favorites for WC2, clear of the NL’s sixth-best team by only 1.5 games. The Mets’ hot start matters to them. The Diamondbacks’ hot start matters to them. Even the Pirates’ hot start matters to them. The wild-card races are always tight, and a team can lose ground in a hurry. A hot streak can erase a bad start very quickly. It works just the same in the other direction. But in any post like this, it’s almost obligatory to mention the gambler’s fallacy. An underachieving team shouldn’t be expected to suddenly overachieve, in order to get back to its regular projection. And, vice versa. Even if you don’t think that, say, the Mets have really improved at all, that doesn’t mean you should now expect them to slump, to negate the eight wins in nine games. While it’s true that baseball is hopelessly cyclical, this isn’t how seasons are understood to work. If you thought the Mets might win 51% of their games before, you should expect them to win about 51% of their games the rest of the way. And then you add on the eight wins and one loss. Teams off to good starts won’t suddenly find their opponents tougher, and teams off to bad starts won’t suddenly find their opponents easier. For most of you, this is old news, but it still always comes up. That’s the thing about popular fallacies. The purpose here is not to suggest that anything’s been determined. And the purpose here is not to suggest that you should already be thinking about the playoffs, nearly six months ahead of time. The only purpose is to serve as an annual reminder that every game matters. For a team with hopes of contention, every early comeback counts, and every early meltdown stings. It’s never too soon for a game to matter, so it’s never too soon for a fan to emote. That’s you! Consider yourself free to care. That’s the whole point, anyway. We hoped you liked reading The Playoff Picture Has Already Shifted by Jeff Sullivan! Not that they are relevant to anything with “Playoff” in the title, but how does a dreadful Tigers team go 4-5 in their first nine games, and somehow decrease their expected number of wins? The FG projections had them as a .421 team, and they are at .444, but their expected number of wins has decreased. I don’t get it. 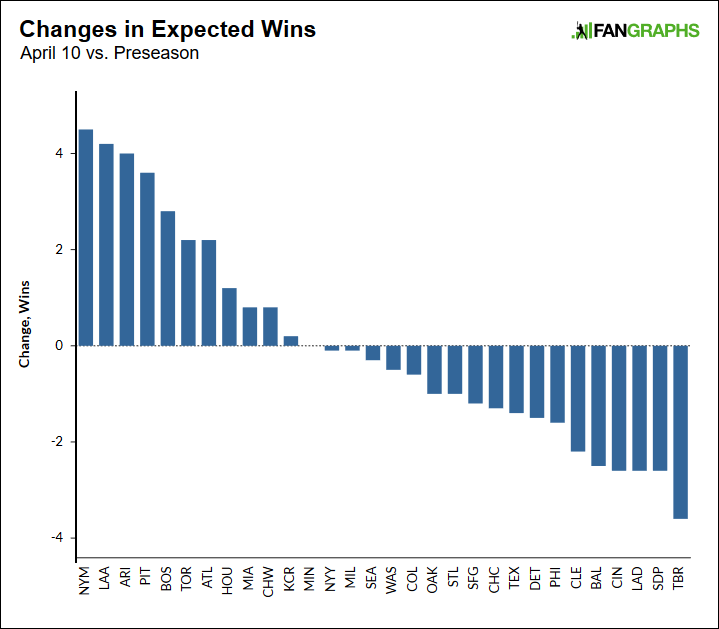 It’s more than just a combination of their YTD record with their preseason wins projection prorated for the remaining number of games. It’s also the changes to DET players’ individual projections and playing time based on results and usage to date. But more importantly is probably the ripple effects of improvements in their opponents. Those extra wins for LAA, BOS, and TOR have to come from somewhere, and it isn’t only going to be division games. DET could be just as good as they were projected two weeks ago, but if their opponents are better that means DET will lose more games. The point about individual projections, etc., makes total sense, but the article really details w/l record so far. IMO it would be weird to change projections of any hitters too much, they’ve played in maybe one game above 40 degrees, so of course those are going to be tough. Any punishment to hitters should be rewards to pitchers, but who knows. While 1/16 of a season isn’t much cause to change a projection, it isn’t nothing. But it’s more about playing time when it comes o individual players. Things like Michael Conforto coming back a month early, for example, can significantly affect a team’s projection. Without knowing the specific answer: Opponent quality, injuries to key players, run diff. below expectations, etc. The team might appear to be “on pace” but it could be that their peripherals show that this is their ceiling, not their baseline, performance. Specifically, I bet some of it’s opponent quality. They got swept by the Pirates and then went 4-1 against the Royals and White Sox, before losing to the Indians (don’t know if that’s rolled in to the projections). Since the Royals and White Sox were projected to be really bad and the Pirates were expected to be not good, I’m guessing that even a projected .421 team would be expected to do better than .444 in nine games against those teams. This doesn’t seems like it should account for two whole wins, though. I would guess that because they’re performing more or less to expectation and expectation is that they will not contend, and will trade off assets extrapolating to fewer wins later in the season? If they had started 8-1 or 15-5 or whatever, perhaps that shifts the paradigm?